Itching for one last trip before the cold takes over. Here is you chance. Below you'll find our top three best Kayak and Canoe trips in Kansas. ​1. Burley Bend to Cave Park. The 10.3 miles from Burley Bend access sight to Cave Park in Oxford offers a multitude of wildlife and potential bald eagle sighting. (Burley Bend is located between Belle Plaine and Udall, right off Highway 55, east side of the river.) On our expeditions page, you'll see one of our trips begins at Cave Park, Oxford. 2. Fall River Wildlife Area. Fall River is one of the only rivers in Kansas with public access on both sides. 70 miles from downtown Wichita, Fall River offers small rapids around Mossy Ford bridge and 8-12 miles of amazing wildlife. As the Willows and Oaks begin to turn for winter you'll see vibrant colors lining the banks of this amazing river. ​3. If you're in the Wichita area, Cowley County State fishing lake is quiet fising only lake an hour South that offers one of the most beautiful waterfalls in the state. Hidden and unknown to most, go to the damn and make your way through the reeds in order to glimpse from above. Stay safe as the water is cooling and enjoy the four day weekend. As many of you have felt the rather warm weather this week. 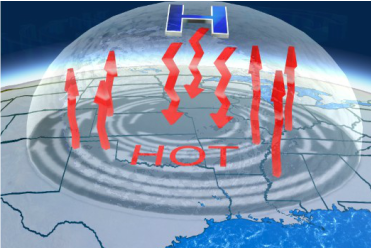 You might not know, that we are currently in a widespread heatwave or what some are calling the 2016 #HeatDome that has centered itself directly over our state. As of July 22, 2016, 124 million people are under an excessive heat warning, excessive heat watch or heat advisory. So, what does this mean for us kayak enthusiasts this weekend? Plan trips early in the morning or later in the evening when temperatures have cooled down. Be aware of heat exhaustion and/or heat stroke symptoms. ​Enjoy the water and be safe out there this weekend. Seven days into the month of July and thunderstorms continue to drench our state with heavy rain. Whether you're living in the Wichita metro, Northeast or Western Kansas all lakes and rivers are filling up and the water is moving quickly. In fact, we're experiencing the wettest month of July to date and are on pace to exceed all previous records. If you're looking to head out on the water this weekend make sure to check out the links above for weather updates as well as download the new Flood Watch app. This will help make your kayaking experience that much better and keep you aware of what might be heading your way. Enjoy the water and be safe out there. The National park service has officially announced that a portion of the Arkansas river is designated as a National Water trail. The first such trail named in the state of Kansas. 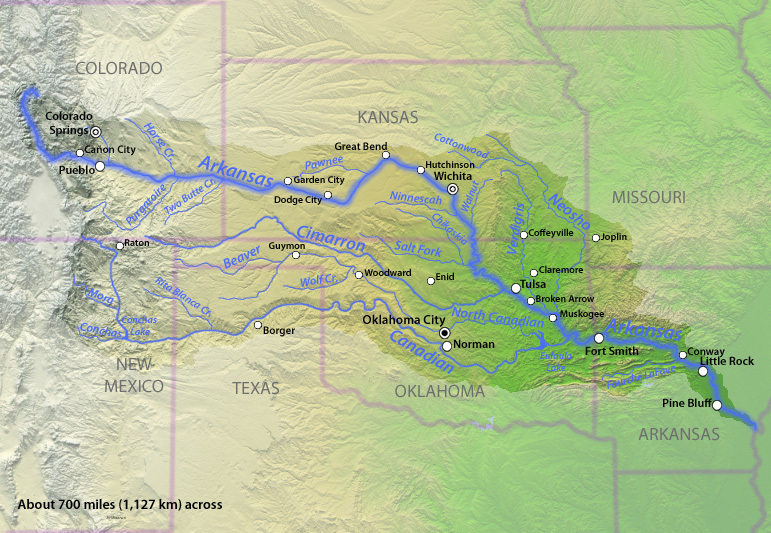 In looking at the map below, the trail begins in Great Bend, KS and then stretches 192 miles ending at the Oklahoma-Kansas border. This designation is a tremendous honor for the people and communities along the river. Anyone interested in 192 mile expedition? Or Pakayak, is revolutionizing kayaking standards in storage and accessibility. Ever wish you could throw your Kayak on your back, not have to worry about strapping an oversized kayak to your roof rack? Well, soon that may be a thing of the past. Pakayak, unlike inflatable kayaks, consists of a specially formulated plastic resin that uses a patented clamping system. This system reduces a 14 ft. kayak to 3 1/2 feet. Incredible, we know. 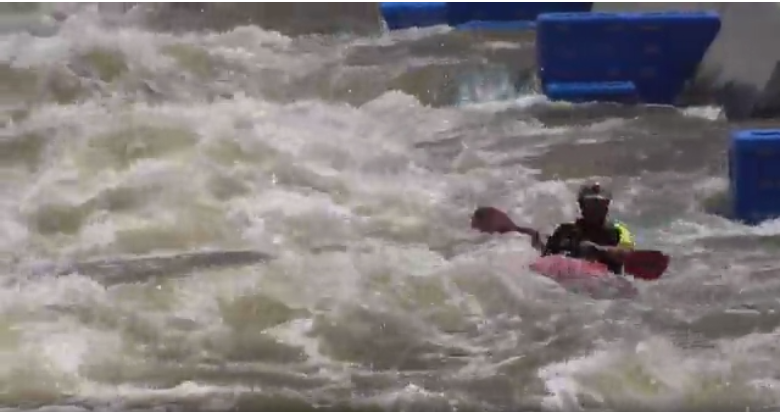 Ever wondered what it would be like kayaking down the tough rapids of Colorado? Want to improve your kayak skillz! Now you can. Riversport Rapids_, located in Oklahoma city, is one of only three man made white water rapids in the United States. If you have free day this weekend go check it out and sharpen your skills for the rough water. Weather is warming up, kayaks are hitting the water. If you're like us and ever wondered where you can drop in on the Arkansas River. Wonder no more. As the Arkansas has several hidden river access points. One of our favorite launch spots is just South of Wichita on the outskirts of Derby. Head South on Interstate 135, exit K15 toward Derby. At 63rd, (Patriot Ave.) turn west and head over the river, then south at Grove. Follow Grove back toward the river and look for the Canoe launch site. Enjoy the water and stay safe. Today we are excited to announce the newly redesigned Kansaskayaking.com. We know, its long overdue. ?However, our goal for redesigning the site was not only to update the look and feel but we wanted to give our readers a better user experience. With the new site, you no longer need to dig through months of old posts to find new expeditions. We've pulled these to a separate page for ease while the content still links back to the original post. Along with continued postings of new expeditions across the state of Kansas, we'll now be posting weekly relevant content as well. Want to know the latest and greatest kayaks that are on the market, weather conditions for the weekend and uncharted Kansas territory well you'll now be able to find it in one place. Stay tuned as we're exited to kick this year off with a bang. You may or may not have heard of Polish kayaker Aleksander Doba. Aleksander in 2010 decided he would cross the Atlantic at it's narrowest point, from Senegal to Brazil. He did so in 99 days. In 2013-14, Aleksander and his kayak dubbed with the name "Olo" took the seas once again crossing the Atlantic now at its furthest point, from Lisbon, Portugal to Florida. The record breaking adventure took 167 days at seas across 5,400 miles and did I mention he did it at the age of 67. If looking for inspiration this Spring, look no further as Kayakers are continually pushing the boundaries and heading into unchanted territories. Also, don't be alarmed if you see KansasKayaking.com taking on a facelift. New season, new look, coming soon. Prior to making that Christmas wish list and sitting on Santa's lap you might take a look at the assortment of Jackson Kayaks. Established in 2003, they are making waves in innovative Kayaks and put out some of the best built Kayaks we've seen. I'm placing the Kilroy on my list, so here's to hoping this year, I made the Nice list. We are landlocked kayak enthusiasts that love to uncover Kansas' true beauty in the water.